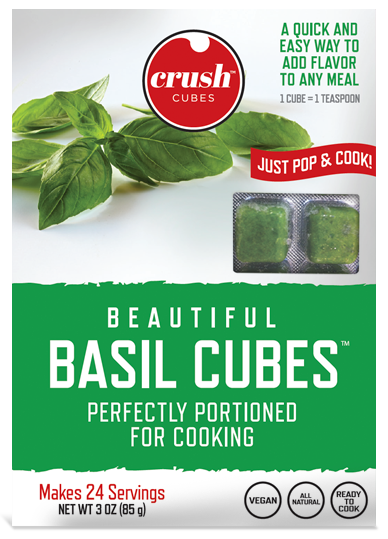 Crush Cubes - The quick and easy way to add fresh herbs to any meal. Our Ginger is GLORIOUS and has a rich and warm aroma that is refreshing with sweet citrus undertones. Who says youth is wasted on the young? We select only the youngest, most tender ginger that is harvested early in the season because it is less fibrous with a more delicate flavor. 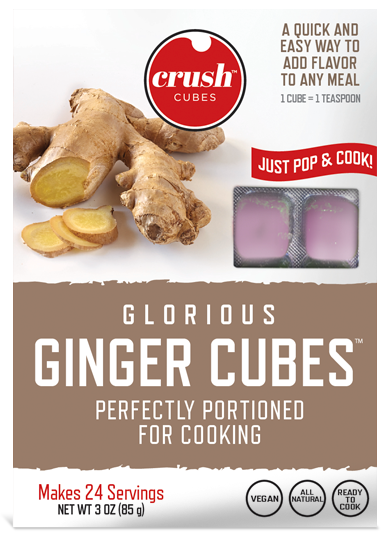 Our ginger is quick- frozen fresh so you can gloriously add it to your to recipes with a single POP. Leave the peeler in the drawer! The beauty in our basil is not just skin deep! The inner beauty of our sweet basil produces a complex sweet, spicy aroma with notes of clove and anise. Basil isn't just for pasta and tomatoes anymore! Be adventurous and try it with seafood, poultry and for a real flavor sensation, add it to your favorite chocolate dessert! We are! 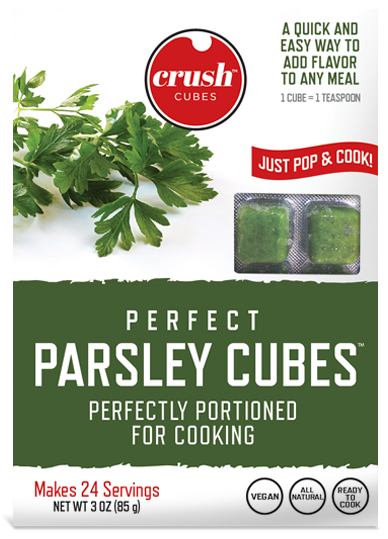 Crush Parsley Cubes are the result of our pursuit for the perfect addition to sauces, soups, stews, meats, poultry, fish, vegetables and salads. Crush uses only the Italian variety that is grown in rich soil giving it a light grassy flavor with a lemony aroma. 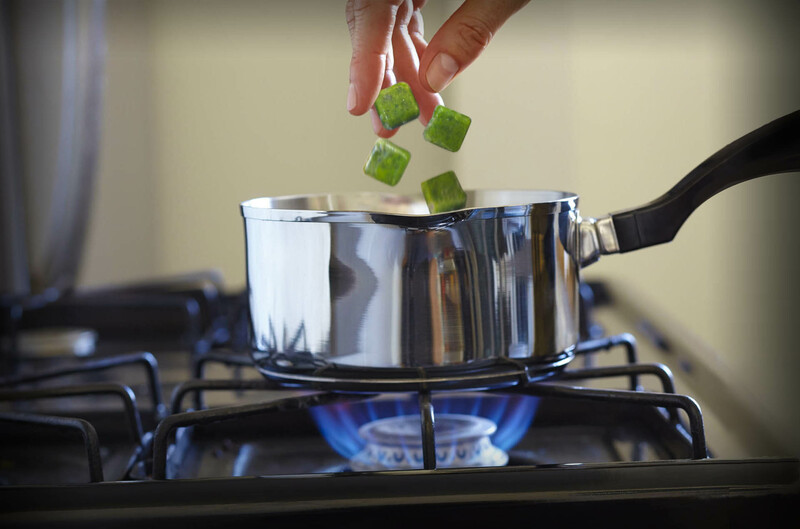 Pair Crush Parsley with our Garlic Cubes to neutralize odors associated with garlic – the perfect combination! It's an Onion! It's a Garlic Clove! No… it's a Shallot! It looks more like garlic but is prized for its mild onion taste that you will savor! Use it instead of onions to add unique taste to any dish. Crush uses only the younger and smaller shallots because they offer the best flavor. 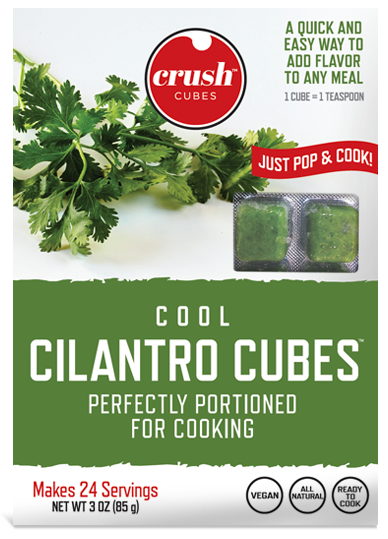 Your friends and family will love the dishes you create with Crush Shallot Cubes, but “savor” some for yourself! Cilantro is a flavorful herb that is fashionably cool all over the world. The flavor is delicate yet complex, with a hint of pepper, lemon and, of course, cool mint. We quick-freeze our cilantro that is grown only during the COOLer time of year when the flavor is at its peak. Combine Crush Cilantro with Crush Garlic and Crush Ginger to make great-tasting curries or some really COOL guacamole! Gorgeous and Good For You! Garlic—the quintessential herb that adds some spice and gives you a healthier life! Our fresh California garlic has a pungent zest that mellows into a savory sweet and spicy essence when cooked. 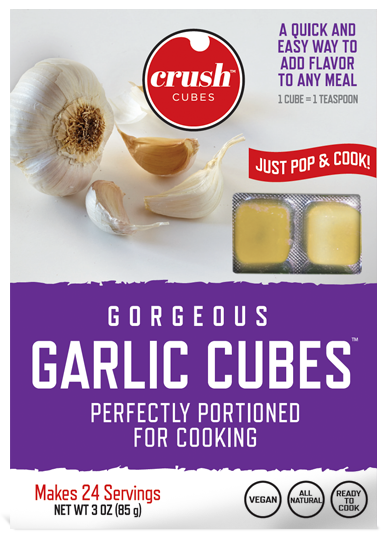 Quick-frozen at the peak of flavor, Crush Garlic Cubes are a convenient way to add mouthwatering zing to all of your recipes! Is Dill in a Bit of a Pickle? 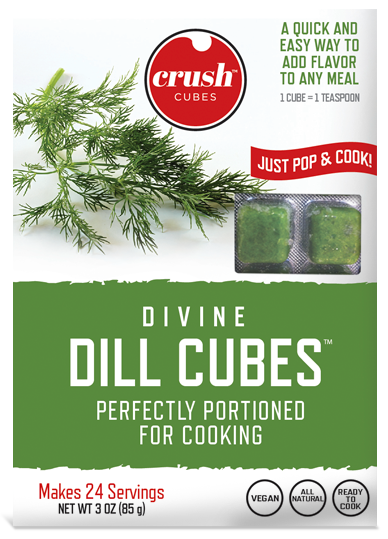 Dill has a divine fragrance of anise and lemon, with a mild but sustained flavor of anise and parsley. This herb is most famous as the quintessential pickling spice! But wait… there's more! Dill has been used for centuries as a medicinal herb to aid digestion and soothe colic in babies. 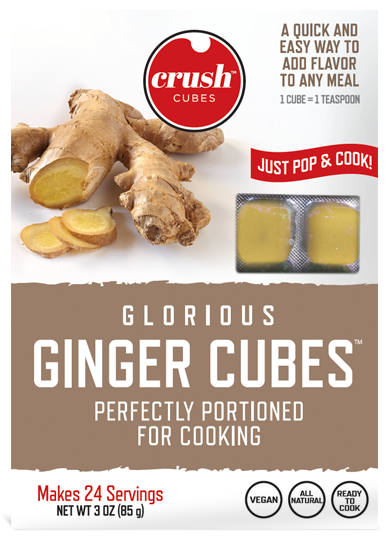 Crush's unique freezing process preserves the essential oils, so these cubes are packed with fresh flavor and nutritional benefits. It is a DIVINE addition to many foods like pot roasts, dips, salads, fish, breads and even cucumber sandwiches. Dill—not just for a pretty pickle anymore! 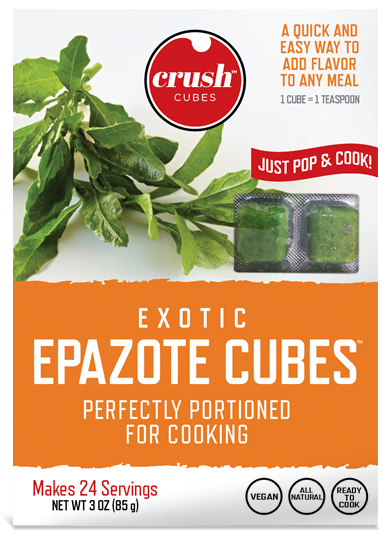 Epazote has an intense flavor combination of mint, citrus, pine, oregano, anise, and mustard greens. This EXOTIC herb mellows during cooking into a marvelous addition to beans, corn, soups and even chocolate-flavored mole. Epazote is said to have carminative, or gas-relieving, properties, so it is often cooked with beans. 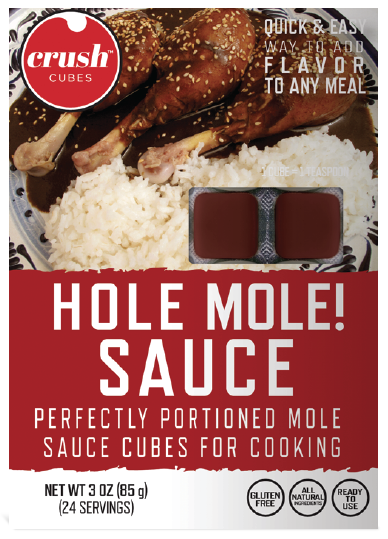 Add a Crush Epazote cube or two to your next pot of beans, otherwise it could be…Holy Mole! We tap the finest forests in Vermont to create our fresh, creamy, buttery confection. 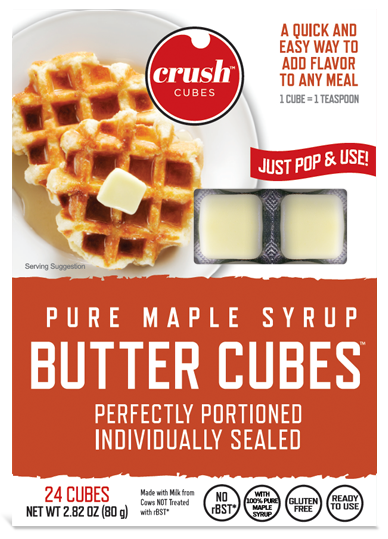 Of course, our Maple Butter is delicious with your favorite breakfast entrée like French toast, pancakes, biscuits and oatmeal. But think outside the cube and turn ordinary vegetables like carrots, sweet potatoes or Brussels sprouts into a culinary treat! Make sure you have maple as your staple! It's the Bee's Knees in this Butter! Our worker bees have labored day and night to produce the freshest honey blended with tangy cinnamon into our sweet, creamy butter. One taste and you'll be swarming to create culinary confections such as corn bread, pancakes, sweet potatoes and even cinnamon bread that will have your friends and family buzzing for more. 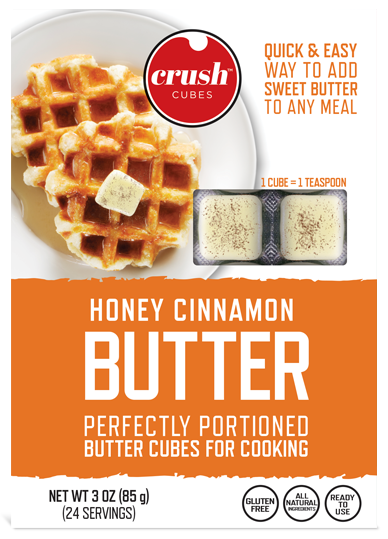 Your hive will thrive and everyone will bee happy with Crush Honey Cinnamon Butter. Garlicky, Buttery Goodness in a POP! Garlic and butter are the quintessential culinary couple. Sprinkle in some savory herbs and it is the ultimate combination of flavor for steak, chicken, fish, scampi, lobster, vegetables, mashed potatoes—even make garlic bread in a flash! Flavor your world with garlicky, buttery goodness! In French, it is called beurre à la bourguignonne; in English, we call it beurre à la Crush! When in Rome, do as the Romans do, and spend hours and hours crushing basil, garlic, pine nuts and parmesan cheese into Pesto. 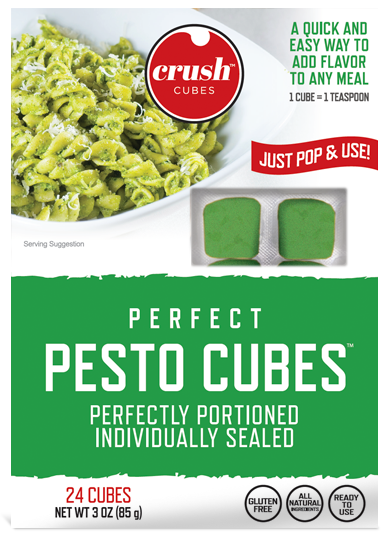 When in America, simply pop out a Crush Cube…and PESTO, you have an aromatic butter to build an empire of spectacular recipes with pasta, bread, fish and more. It's better with butter. With Pesto… it's Amoré! 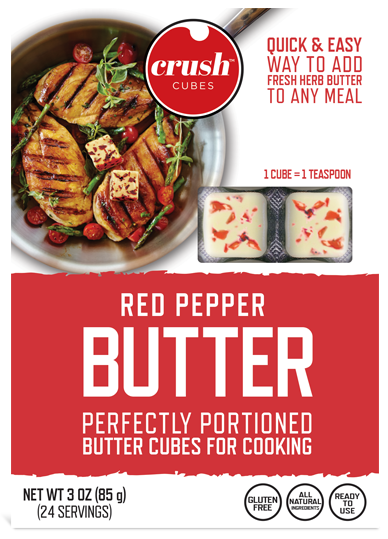 We have peppered our creamy butter with a fresh and fiery blend of ancho, bell and cayenne peppers to create a sweet and savory butter like no other. Those red pepper flakes found on the table of your favorite Italian restaurant are now out of the jar and into the cube! 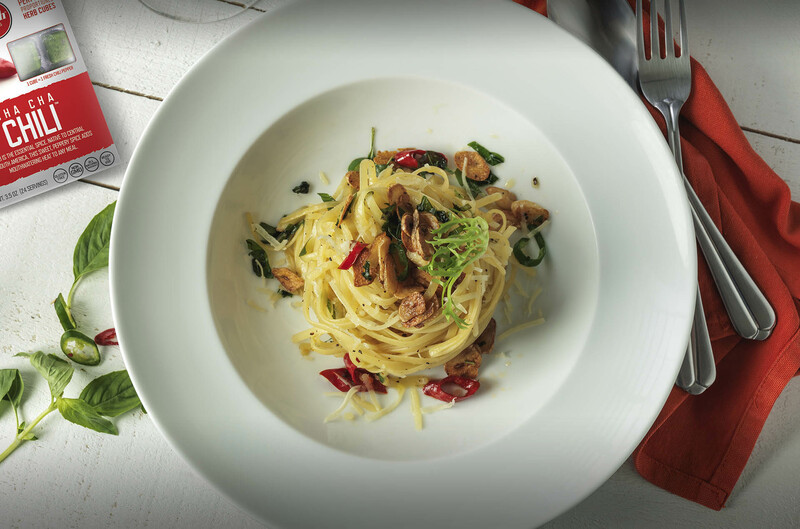 Enjoy Red Pepper butter with grilled corn on the cob, pasta, stir fry and meat dishes. We've turned up the heat - so don't be flake! Butter it instead! Zestfully Go Where No Butter Has Gone Before! What do you get when you cross lemon zest with cracked black peppercorn? 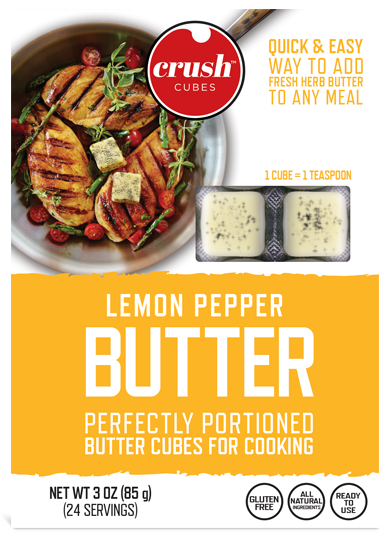 A savory, citrus infusion that is mixed into our fresh, creamy butter to produce a tangy flavor that is out of this world! Use this flavorful butter to easily turn any seafood or poultry dish into a masterpiece! Make a simple vegetable dish taste like it was prepared in a French bistro, and zestfully go where no butter has gone before! The Soup-er Cube that is Soup-er Good For You! Was Mom right about chicken soup being good for you? Recent research studies suggest that Mother knows best! So we listened to our mothers and created a Soup-er Cube to make chicken soup just like Mom makes. Crush Chicken Bouillon cubes are all natural because they are quick-frozen, so we don't need to add chemical preservatives. Have some homemade chicken soup made with our chicken Soup-er Cubes, and you'll be feeling Soup-er! You Won't Be Crying Over These Cubes! 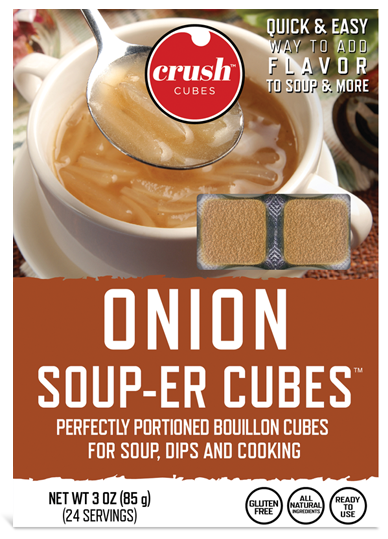 Crush Onion Soup-er Cubes are packed with sweet and savory onions that will Soup-er charge your favorite recipes. Use them for soup, gravy, dips, rice and any dish that can use a hearty dash of onion flavor. There's no more shedding tears in the kitchen because our flash-frozen, all natural (no chemical preservatives) onion bouillon cubes can be kept conveniently in the freezer—ready to pop and use at a moment's notice. They'll add layers of flavor to every dish! It's a Vegetable! It's a Spice! No, It's a Soup-er Cube! 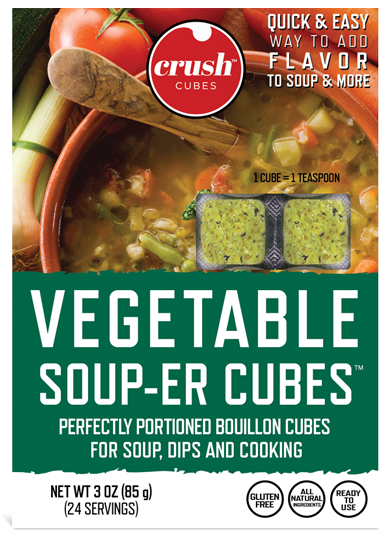 Soup-er size your vegetable soup, casseroles, rice pilaf and more with our Soup-er blend of vegetables and spices in condensed bouillon cubes. 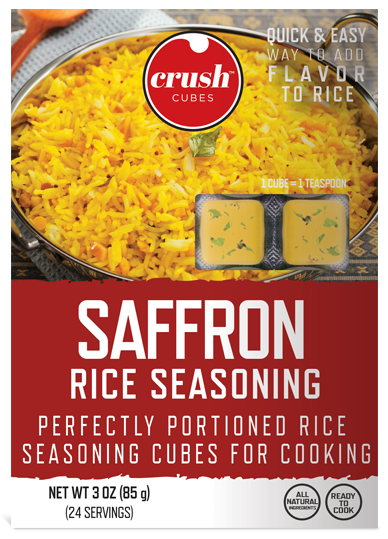 Crush Soup-er Cubes are made from real vegetables and spices, then quickly frozen to preserve their freshness. After all, why would you want to add salt and chemical preservatives to your healthy dose of vegetables? Our Vegetable Cubes are Soup-er natural! Saffron is the spice of royalty because it is expensive to harvest. Now you can transform white rice into a sought-after dish with our Saffron Rice Seasoning. Your rice will be really nice with the exotic and complex flavor of saffron. Use it to create Spanish paella or risotto, served alongside your favorite meat or seafood entrée. You are the King or Queen of your kitchen, so make sure your rice is up to The Gold Standard! Our Thai Yellow Rice seasoning will make your rice look like a celestial pot of gold! Thai tradition is to make a kettle of this golden rice to serve at parties and ceremonies as a symbol of wealth, dignity and good fortune. Our secret ingredient is turmeric, which infuses rich, subtle flavor and purportedly boasts valuable health benefits. 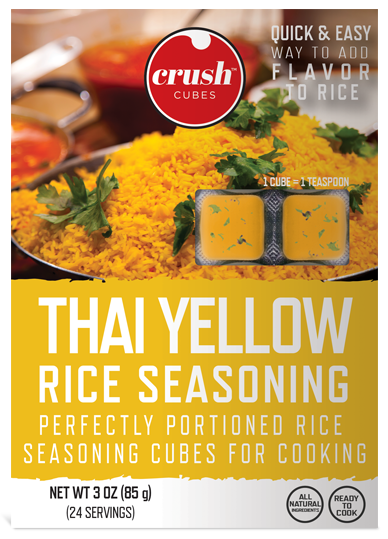 Stop chasing rainbows, and find your pot of gold with Crush Thai Yellow Rice Seasoning. Curry Favor with this Curry Flavor! 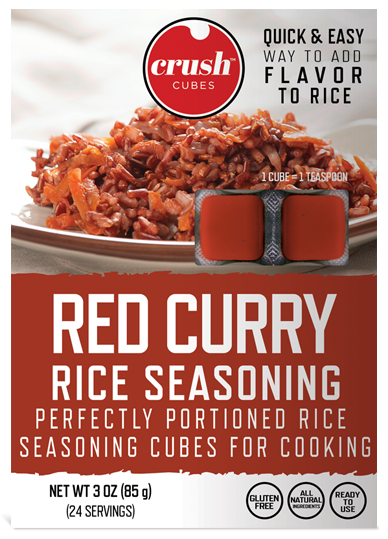 Our blend of red curry and selected spices from the land of India will turn ordinary rice into an exotic dish. From the country that introduced us to meditation and Yoga, comes a sweet and spicy seasoning that has perfect balance! Serve a rice dish with this delicious seasoning to curry favor with your friends and family, and enjoy great KARMA! When life hands us lemons, we cube them! 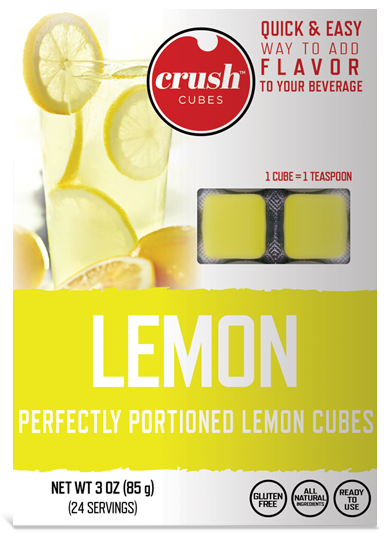 Our Tangy Lemon Cubes will add zest to almost any beverage— alcoholic or not! Use them for a sour twist in any cocktail, or simply flavor water, soda or iced tea. But wait… there's more! You can use them for cooking as well! Pop them onto fish, stir- fry and anywhere you need some lemon zest. Lemonade anyone? These cubes are made from real REAL LEMONS! 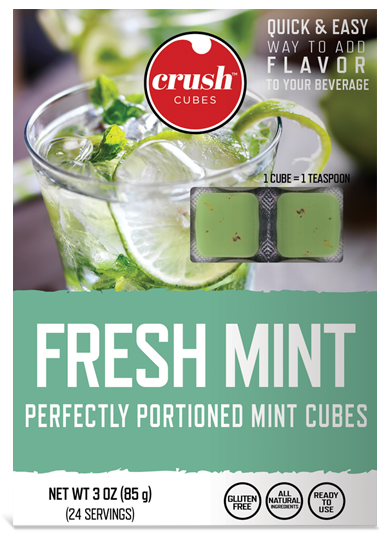 Whether you're sipping mint juleps on the porch or mojitos by the pool, Crush Fresh Mint Cubes provide a Fresh Burst of mint to any cocktail or non- alcoholic beverage. Pop these minty cubes into soda or water for a unique beverage, add it to your iced tea, or even give it a try in soups and stir-fry. With so many uses, these cubes are worth a MINT! Spend more time mixing and mingling with your guests and less time mixing your drinks with our Margarita Cubes. 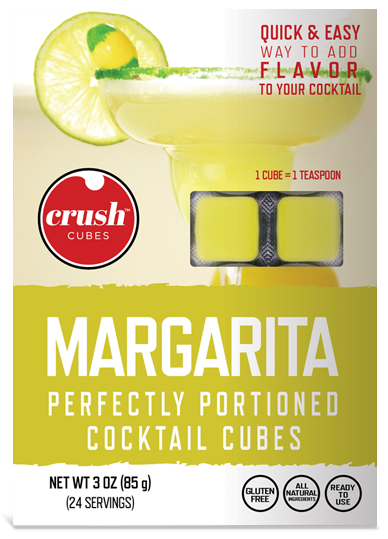 Blended or on the rocks, create the perfect margarita with our perfectly portioned cubes. Just pop and mix. Make it a fiesta, not a siesta! It's Time for Some Lime! If you don't want to sour your beverage with lemon, then it's time for some lime! 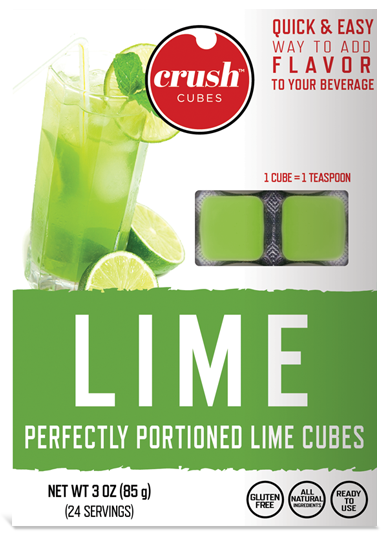 Our lime cubes are tangy and cool with a refreshing citrus chill. Drop them in water for instant limeade or use them to add some zest to your favorite spirited beverage. Ever try to get a lime wedge into a bottle of beer? Now you can fit our square cubes into a round hole! And these cubes enhance food as well! Use them to add zest to meats, seafood and vegetable dishes. Hair of the Dog, Chip off the Cube! Don't spend all morning making that Bloody Mary! 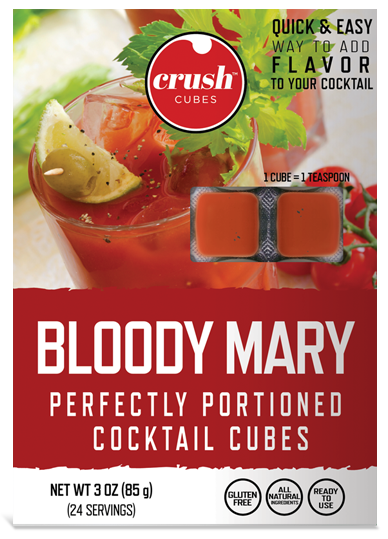 Mix it quickly and quietly with Crush's Bloody Mary Cocktail Cubes. This little cube, packed with tangy spice and flavor, will turn ordinary tomato juice into a SNAPPY drink that will make a dog's hair stand on end! 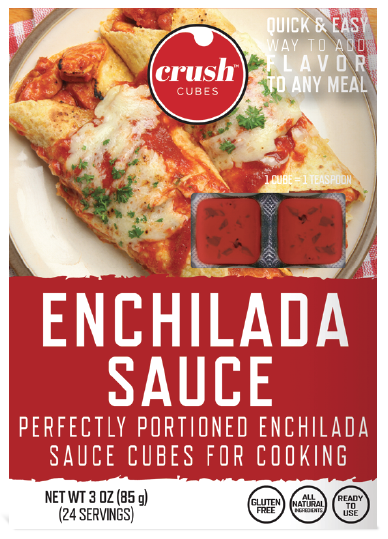 Make your food a FIESTA and not a SIESTA with Crush Red Enchilada sauce. The enchilada dates back to the ancient Mayans, but without the convenience of Crush's tangy Red Enchilada sauce, they didn't have the WHOLE ENCHILADA! But's it's just not for enchiladas anymore! 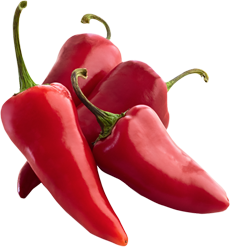 Use on your burrito, huevos rancheros, meats - even rice. It's Fiesta Time! The name Pesto stems from the Italian word pestâ, which means to pound or to Crush… and so we have! 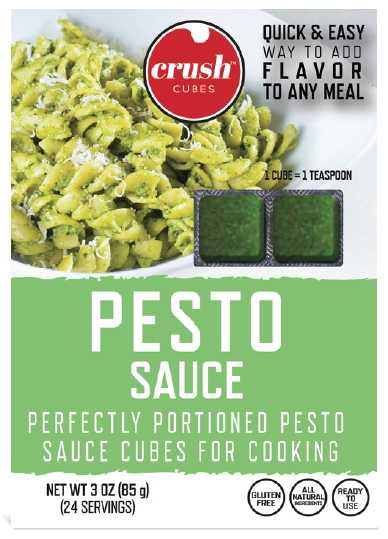 Our Pesto is a blend of basil, garlic, pine nuts, olive oil and parmesan cheese crushed into a masterful sauce! Use it with pasta, meat, corn and more. It even makes one a spicy meat-ta-ball! Crush Pesto… it's the Besto! Crush has combined savory poblano chile with rich dark chocolate to create an incredible bittersweet sauce that will have you saying Holy Mole! Crush Mole Sauce makes it easy to create spectacular dishes with chicken, enchiladas and other dishes that will taste Muy Bueno! More poblano? No problemo! A Spot of Tikka Masala Anyone? 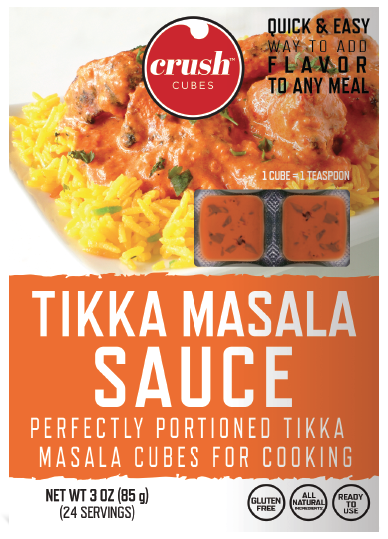 Tikka Masala is an East Indian sauce invented in England and considered to be a true British National Treasure! Crush has created a Tikka Masala recipe inspired by its origin that had regular blokes lining up on the streets of Glasgow to get their fill of Chicken Tikka Masala. Add this savory and spicy sauce to your chicken, meat and vegetable dishes for a taste that you too will truly treasure! 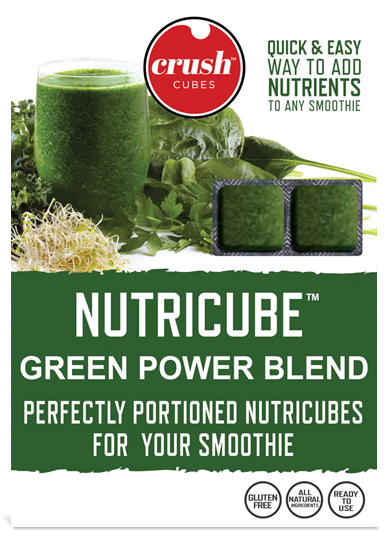 Our Nutricube™ Green Power Blend will have other smoothie products green with envy. Green Power is a concentrated mix of green superfoods designed to “kick-start” what would be an ordinary smoothie. The convenient cubes are great for people on the go because you can supercharge your smoothie quickly and easily. Our Nutricube SUPERFOOD will make you feel like a SUPERHERO! Be well and prosper! 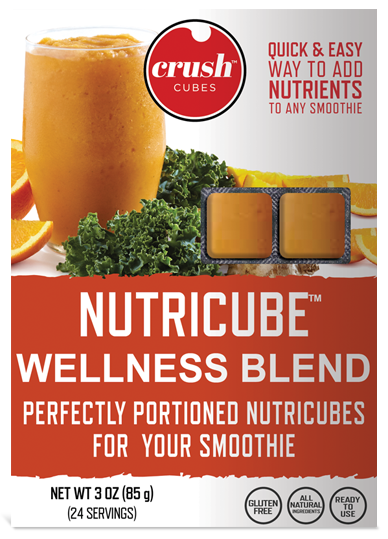 The Nutricube™ Wellness Blend is designed to help your nutritional nirvana with our golden cubes that add “wellness power" to your smoothies. We pack an enterprising number of antioxidants into our sweet citrus blend, including zinc and vitamins C and D. The Nutricube™ is a convenient and fast way to add essential nutrients to enrich your smoothie at light speed…because gathering all of these nutrients separately is highly illogical! Crush is an all-natural way to cook fresh with big flavor, providing a quick and easy way to add spices and herbs to any dish. Say goodbye to time-crunch canned creations and microwaved meals. 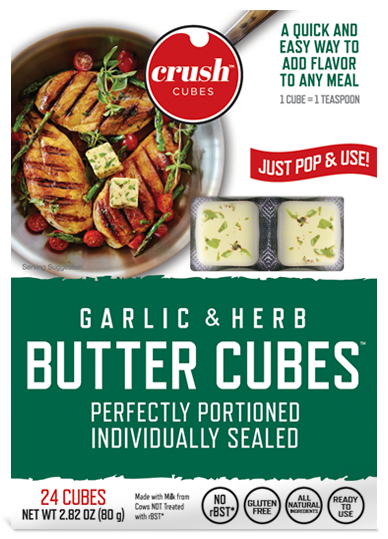 Our herbs and spices are flash-frozen fresh to assure no loss of nutrients, flavor, color or texture, and the convenient crush-out cubes come in measurable portions for the perfect amount of flavor. 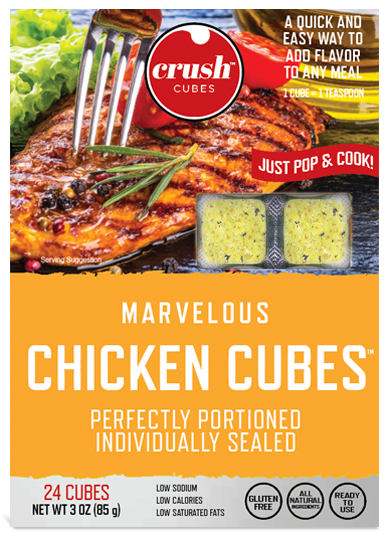 Our cubes last a long time in the freezer, so you'll have them ready when you're ready to "POP" them into next your culinary creation!